Casa Olita will charm you with its seclusion and sophisticated touches. Soak up the pristine Caribbean vistas from your private dock, take a dip in your personal plunge pool or cool off in the alfresco showers. Other luxurious touches include a king size bed dressed in Yves Delormes sheets, Zirocotte and Jobillo wood paneling, and mosquito netting. Complete with a private dock and personal plunge pool, Casa Manana’s features a king size bed with sumptuous Egyptian cotton sheets, which is positioned in the center of the villa with a 180 degree wrap-around view of the Caribbean. Other beautiful features include granite counter tops and exotic hardwood cabinets. Benefiting from the best natural breezes on the island, Casa Brisa’s plunge pool is positioned on your personal verandah for spectacular views of the azul lagoon. Choose between a pair of twin beds or one king bed in your secluded hideaway, which also features Yves Delormes sheets, cabbage bark ceilings, mosquito netting, large Santa Rosa verandahs and a private dock. Casa Solana is secluded on the western tip of the island, allowing you to witness the most spectacular sunsets. With distinctive Caribbean architecture and chic island décor, Casa Solano creates a refreshing and relaxing atmosphere for you to unwind, with an expansive verandah, separate dining area, private infinity plunge pool and dock. Consider yourself a star in Casa Estrella, a beautiful two-story, two-bedroom villa. The upstairs bedroom has an open-air design and hardwood floors. Downstairs you can enjoy a 180 degree view of the Caribbean, with doors on three sides opening directly onto the sea. Clearly distinguishable by its grand size, Casa Estrella also features a personal plunge pool, an alfresco shower, and a choice of twin or king sized beds dressed in Yves Delorme linens. With two bedrooms that can be furnished with either king beds or four twins, Casa Aurora offers the best flexibility, whether for a family, a group of friends or two couples. Your personal pool is the largest on the island and the two oceanfront bedrooms each have sleek baths and a personal deck. Casa Aurora is also adorned with exotic hardwood furniture and Yves Delorme linens. The one bedroom, over-the-water bungalow is appointed with every imaginable comfort, custom-crafted furnishings and amenities. This unique bungalow is the most intimate, romantic and in-demand accommodation on the island. 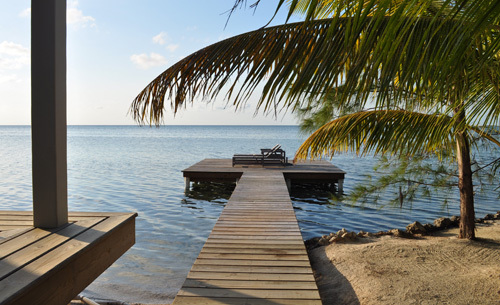 Casa Ventanas is perched at the end of a dock that stretches over 150 feet off the island for the ultimate in privacy. 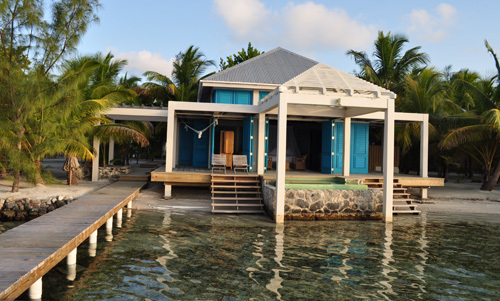 Surrounded on all sides by the beautiful, turquoise blue Caribbean Sea, Casa Ventanas is a picture perfect window on the exotic water world of Belize. Your Head Chef is Patrick Houghton, a graduate of the California Culinary Academy and trained in European, French and Italian cuisine. Patrick combines the structure of his formal training and authentic techniques with soulful creativity and innovation. Cayo Espanto takes great pride in offering culinary treasures whilst using the amazing local products Belize offers. All rates are per night, per couple, per house (except full island bookings) – including meals and drinks. All rates are subject to 9% hotel tax and 15% service charge. – All meals and drinks: 3 tailored meals per day; guests’ favorite snacks; rack bar drinks, beer, sodas, fruit juice, bottled water (drinks exclude wine, dessert wine, champagne and cordials). – San Pedro Airport Greeting and transfer. Cayo Espanto offers a scheduled, daytime, boat launch to/from San Pedro daily.